On Beltane (May 1), I think our rainy season started here in the Lake Chapala area. The clouds built up steadily during the day, mostly south across the lake. We saw a few little flashes of lightening around 6 p.m.. By 8:30 or 9, we had a thunderstorm, the kind I remember from growing up in Illinois. Lightening vibrating the sky in big arcs; thunder, rumbling like earth’s anger; and a long drenching rain. We watched the show from our mirador (rooftop deck) for quite some time. The rain was loud on the plastic patio cover roof. The electrical energy was palpable all around us. The next morning as I went out for exercise along the lake, the air was fresh. The cobblestones were damp (not dusty!). The sand on the beach was furrowed in places where streams of water ran into the lake from the streets. In the afternoon, we had a smaller, less spectacular storm but we enjoyed that one as well. During travels in Mexico, many have told me that they love the rainy season the best. They say, “Everything is so green and fresh!” I am grateful to be here to experience this rainy season and look forward to it with anticipation — green mountains, flowers, fresh mornings and roaring thunder in the evenings. What I’ve seen so far here beats the rainy season in the Pacific Northwest. Here, there is sun, powerful electrical energy, and cooling after a hot day. While I do enjoy a rainy day of soup-making, cookie-baking and sitting by a fire, the energy of the dark grey drizzle in the NW doesn’t crackle and charge me like the rain energy here. This entry was posted in Mexico and tagged Ajijic, Lake Chapala, Oregon, rain on May 8, 2018 by czelazek. We took off on Wednesday to spend a few nights in the woods. The weather prediction was iffy, but we had cleared our calendars and decided to go anyway. We drove east on Highway 126, stopping at Takoda’s for lunch to fortify ourselves. Our original plan was thwarted when we learned that Highway 242 is still closed for the winter (evidently scheduled to open on June 20). Instead, we ended up at Coldwater Camp on Clear Lake. After setting up our tent and tarp and pulling the pizza dough out of the cooler to rise, we started a walk along the lake. 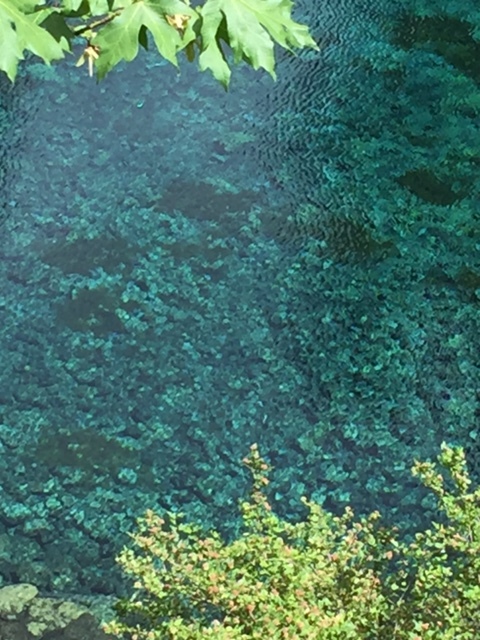 The lake lives up to its name as it is incredibly clear. So many shades of deep and bright blue, really lovely. We kept walking and ended up going all the way around, which turned out to be 5 miles. 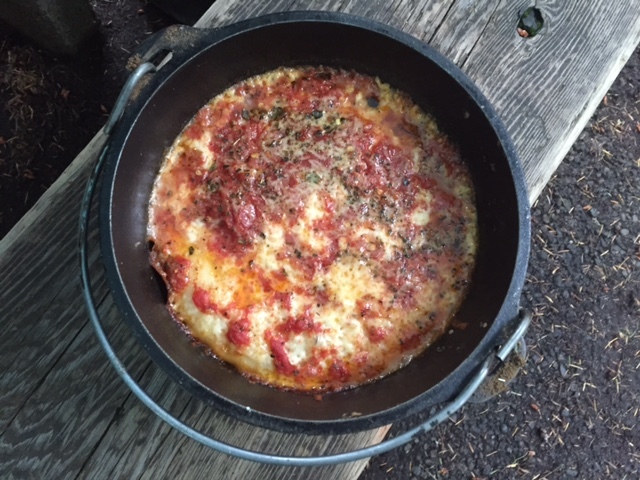 First night’s dinner was dutch oven pizza and kale cooked in a little butter. Dessert? Need you ask? S’mores! I think it is the only time we ever eat marshamallows. The rain held off until we were snug in our tent and we heard it off and on throughout the night. The next morning was rain-free, however. We made our plastic bag omelets with a side of re-heated tater tots (leftovers from Takoda’s). 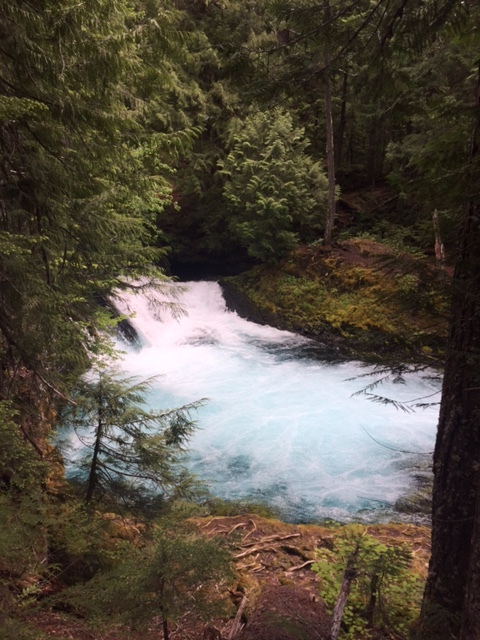 We packed up our lunch and headed out along the McKenzie River trail. A little chilly, but rain-free. Due to our lack of map and a disagreement about which way to go at one point, out hike ended up being very long. In fact, it was the longest I had ever hiked — 15.5 miles. We were dang tired when we got back to camp just as it started to drizzle. 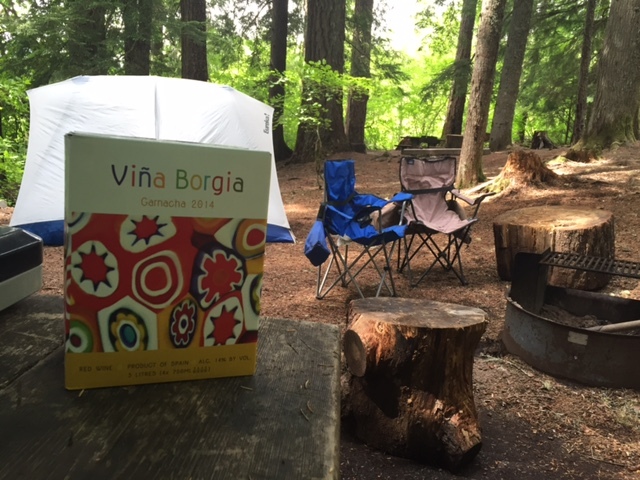 Our box of garnacha tasted perfect (highly recommend the 3-liter box of Vina Borgia!). The drizzle let up and we did an easy dinner of bean and cheese burritos, salad, and more s’mores. We had rain again overnight. Unfortunately, it didn’t let up in the morning. 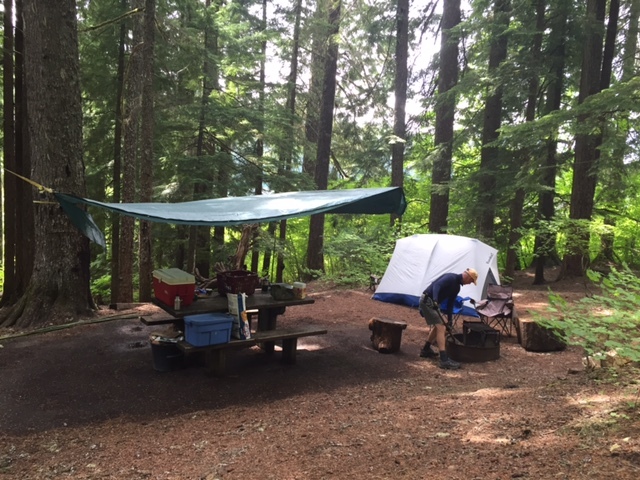 We ate our oatmeal under the tarp and and we packed up all of our items in the rain. An excellent first trip and we were super lucky with the weather. Can’t wait to go again! 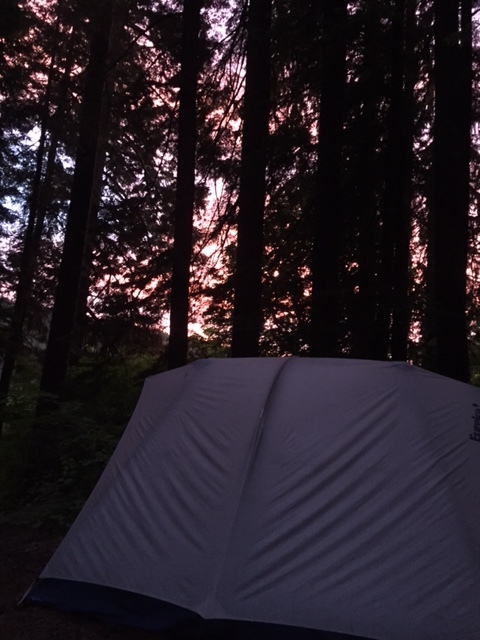 This entry was posted in Travel and tagged Camping, Clear Lake, McKenzie River, Oregon on June 28, 2016 by czelazek. The end of summer brings the wine harvest here in the Willamette Valley. This year, it was quite early (early September versus mid October-ish) and prolific. 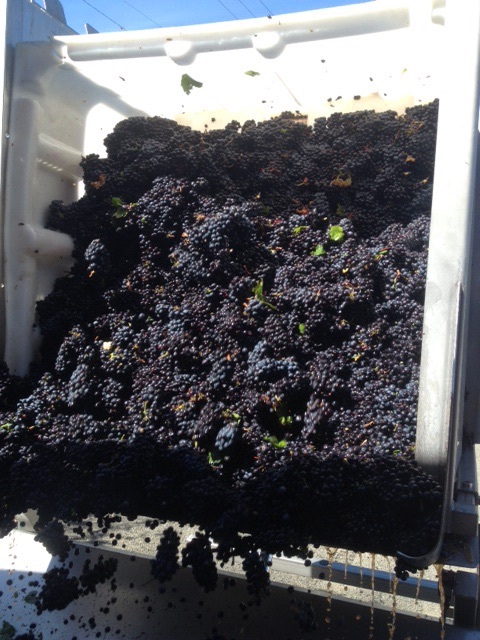 We were happy to be able to spend a few days helping with crush at Broadley Vineyards in Monroe. 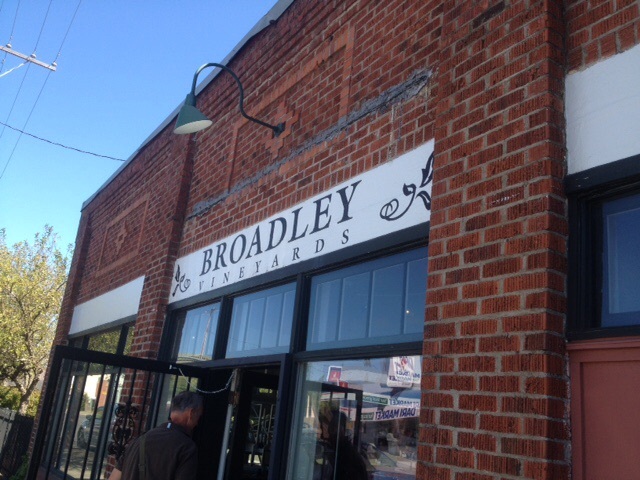 We became acquainted with the Broadleys when we fell in love with their Pinot Noir. Then we met Claudia and Craig Broadley, and the next generations of Broadleys who are all making great wine at a small family-owned winery — and we were hooked. — Don’t manhandle the fruit. — Pull off anything you wouldn’t want to eat (leaves, “sunburned” raisn-y grapes, un-ripe grapes). This entry was posted in Travel and tagged Broadley Vineyards, Oregon, pinot noir, Willamette Valley on October 12, 2015 by czelazek.